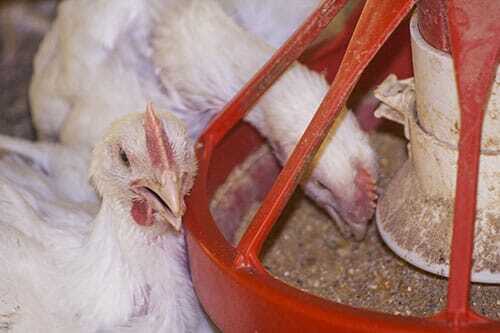 Is Poultry Performance Affected By Feed Particle Size? 8 September 2015, at 12:00a.m. Feed particle size manipulation has recently become a “hot topic” as a means to improve the efficiency of poultry live performance. During the 2015 Midwest Poultry Federation Convention in Minnesota, Dr Adam Fahrenholz and Dr John Brake, from the Prestage Department of Poultry Science at North Carolina State University, presented recent findings. Interest has been driven by the juxtaposition of classic theory (i.e. finer grinds lead to improved digestion) with the relatively modern idea that coarse ingredients are necessary to complement the natural design and function of the gastro-intestinal tract (GIT). As with most animal performance research, evaluating the impacts of feed particle size largely concerns live performance criteria such as feed intake, body weight, and feed conversion. Additionally, questions of particle size manipulation must also take into account the impact on feed manufacturing methodology. This impacts both feed mill efficiency (e.g. energy consumption and throughput) and finished feed characteristics, most specifically pellet quality and feed ingredient segregation. Particle size reduction is the second-most common feed manufacturing process (mixing is first), and thus has a substantial performance impact in the global sense. Grinding is most typically associated with the size reduction of cereal grains. However, other ingredients, such as oilseeds and by-products, may also enter the grinding stream, especially in post-batch grind operations. In general, the reduction in particle size leads to increased ingredient surface area, leading to more intimate interaction with digestive acids and enzymes in the GIT. However, the presence of the gizzard and the physiological functions afforded by reverse peristalsis makes it obvious that the chicken did not evolve to consume only fine particles. The lack of adequate gizzard function, and resultant reduced GIT retention time, has a negative impact on live performance. Thus, interest in coarse particle inclusion has grown recently. There are many variables that come into play that can acoarse cornentuate or diminish the impact of feed particle size manipulation on animal live performance. For example, litter type (size and texture) and management strategies will determine the acoarse corness to non-feed coarse material. Also, differences in animal age, production stage, and purpose (e.g. meat vs. offspring production) must be considered. Dr Adam Fahrenholz and Dr John Brake presented some recent work focused on the manipulation of feed particle size, in the presence of the aforementioned variables, and the overall impact on animal live performance as well as feed milling characteristics. Chewning et al. (2012) conducted an experiment where corn particle size averaged 270 or 570 microns, and diets were fed to broilers as mash or pellets. The finer grind did lead to an improved body weight at 21 days, but not at 35 days and 44 days. Smaller particle sizes led to improved feed conversion ratio in the mash diets, but there was no observed difference in the pelleted diets over the course of the experiment. It was concluded that reduced particle size did not improve live performance in a pelleted diet. 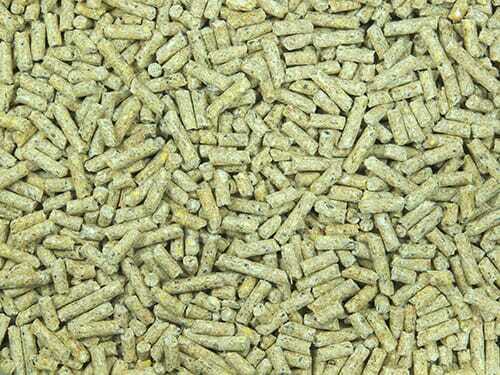 On average, pellet durability did improve with the finer grind (88 per cent vs. 84 per cent). While statistically significant, the decrease in pellet quality (and a corresponding increase in fines in the feeder) was apparently not large enough to have a negative effect on performance in comparison with the diet containing the finely ground corn. The upshot of these results is that bird performance was equal, while grinding costs would have been diminished. The next step was to begin including coarsely ground grains as a component in the overall diet. This would generally be done by combining two product streams, a fine grind corn and a coarsely ground corn at a substantially higher particle size. Xu et al. (2013) fed broilers two dietary treatments, with coarse corn (maize) making up 0 or 50 per cent of the total dietary corn. Fine corn (hammermill ground to 270 microns) and coarse corn (roller mill ground to 1,150 microns) were blended prior to pelleting to create the dietary treatments. The inclusion of coarse corn led to improved body weight and feed conversion ratio. In order to evaluate the impact of litter availability, birds in this study were raised on multiple floor types, including netting as well as new and old litter. Birds on new wood chip litter had improved performance even in the absence of coarse corn, reinforcing the theory that coarse material consumption aids GIT function. A following study by Xu et al. (2015) evaluated three coarse corn inclusions (0, 25, 50 per cent) in a cage study. Feed was fed as crumbles and pellets, with pellets having been screened to remove the fines. Fine corn was approximately 295 microns, coarse corn was approximately 1360 microns, and the mash diets containing 0, 25, and 50 per cent coarse corn were determined to have mean particle sizes of approximately 430, 541, and 640 microns, respectively. With the inclusion of 0, 25, and 50 per cent coarse corn, PDI was 92, 93, and 90 per cent, respectively, showing no practical difference. As with previous studies, coarse corn increased body weight and improved feed conversion ratio, and was also shown to increase gizzard weight, increase digesta retention time, and improve apparent ileal digestibility. Auttawong et al. (2013) also fed broilers two dietary treatments, in this case having 0 or 35 per cent coarse corn. Fine corn was approximately 260 microns and coarse corn was approximately 1,080 microns, and all diets were pelleted. Birds were fed ad libitum or on a time-limited basis. As in other experiments, coarse corn improved feed conversion ratio when the birds were fed ad-libitum. However, when feed was time-limited fed the coarse corn effect disappeared. Dr Fahrenholz and Dr Brake theorised that the restricted birds, being hungrier, consumed litter when feed was not available and consumed all feed regardless of pellet quality when given the opportunity. As in the study above, consumption of litter likely aided gizzard function in a similar manner to coarse corn inclusion. A second study by Attawong et al. (2014) again investigated coarse corn inclusion (0, 10, 30 per cent) in the presence of varying mixer-added fat application. Fine ground corn was approximately 290 microns, coarse corn was approximately 805 microns, and mixer-added fat ranged from 0.75 per cent to 3 per cent. At 28 days, coarse corn inclusion improved feed conversion ratio, while 3 per cent mixer-added fat produced poorer feed conversion ratio. Neither factor had an effect on body weight and, by 35 days, there was no coarse corn or post-pellet fat effect on feed conversion ratio. Overall, with 3 per cent mixer-added fat, feed conversion ratio was poorer with coarse corn inclusion compared to diets with fine corn. This likely demonstrates a pellet quality effect, as both coarse corn and mixer-added fat led to reduced pellet durability. The data also demonstrated that, while 805 micron corn was sufficient to obtain the coarse corn effect in younger birds (<28 days) a larger particle size was likely necessary thereafter. Recalling the first-described experiment of Attawong et al., the results for time-limited fed birds raised questions concerning the impact of coarse material in certain situations, such as in breeding and laying operations. Lin et al. (2013) fed broiler breeders that have been placed in individual cages two mash diets from 24 weeks of age into production, one containing 0 per cent coarse corn and the other containing 50 per cent coarse corn. As is typical for breeders, birds were restricted-fed. The fine corn diet increased production (egg mass and number), while the coarse corn produced smaller body weight birds that began producing eggs later, and were unable to produce at the same rate. It was concluded that the fine corn provided the necessary energy under the restricted feeding conditions. However, these breeders had been grown on little floors so that they had fully developed gizzards at 24 weeks of age. Taking this experiment into account along with the others demonstrates how particle size must be manipulated, even within a single genetic line, based on feeding practices and production requirements. Particle size reduction research has also been carried out on ingredients other than corn, most commonly co-products and by-products, such as soybean meal (SBM) and distillers dried grains with solubles (DDGS). These ingredients may arrive to the feed mill at a range of particle sizes depending upon supplier and manufacturing technique. In order to evaluate the impact of non-grain particle size on broiler live performance, a series of experiments was conducted by Pacheco et al. (2013, 2014). In the first experiment, DDGS with a particle size of 700 microns were obtained, and a representative fraction was ground to 350 microns. Birds fed pelleted diets containing 350 micron DDGS had greater BW at 42 days of age, and in general performed better. However, birds fed 700 micron DDGS had greater gizzard weights, again typical of experimental treatments with coarse material. In the next experiments, SBM particle size (410 or 1025 microns) and DDGS inclusion level (15 or 30 per cent) and particle size (480 or 745 microns) were evaluated. The inclusion of fine SBM led to an improvement in pellet quality, but coarse SBM had an overall positive effect on live performance. Fine DDGS actually decreased pellet durability, as did an increased inclusion rate, but overall pellet durability values were similar. Fine DDGS led to an increased feed intake and body weight, with no impact on feed conversion ratio, and coarse DDGS increased gizzard weight. There is a great deal of work remaining to be done on feed particle size manipulation relative to poultry live performance. This includes zeroing in on the appropriate distribution of particles, determining the best manufacturing methods, and looking at methods for product evaluation. coarse material may decrease pellet quality, but not as much as some might think, and it can be managed with good attention paid to the rest of the process. Auttawong, S., J. Brake, C. Stark, and S. Yahav. 2013. Time-limited feeding of grower feed negates the effects of corn particle size, dietary energy level, and post-pellet liquid fat application on broiler live performance from 14 to 28 days of age. Poult. Sci. 92 (ESuppl. 1):32. (Abstr.). Presented at PSA Annual Meeting, San Diego, CA. Attawong, S., A. C. Fahrenholz, and J. Brake. 2014. The effect of dietary corn particle size and post-pellet liquid fat application on broiler live performance. Poult. Sci. 93 (Esuppl. 1):26. Presented at PSA Annual Meeting, Corpus Christi, TX. Chewning, C. G., C. R. Stark, and J. Brake. 2012. 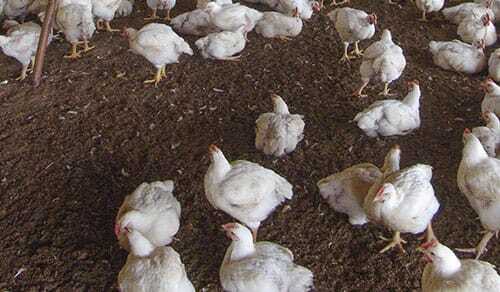 Effects of particle size and feed form on broiler performance. J. Appl. Poult. Res. 21: 830-837. Lin, Y. M., C. R. Stark, and J. Brake. 2013. Effect of a severely restricted feed program at the onset of lay and corn particle size on performance of three weight classes of broiler breeders. Poult. Sci. 92 (E-Suppl. 1):63. Presented at PSA Annual Meeting, San Diego, CA. Pacheco, W. J., A. C. Fahrenholz, C. R. Stark, P. R. Ferket, and J. Brake. 2013. Effect of particle size and inclusion level of Distillers Dried Grains with Solubles (DDGS) and pellet quality on growth performance and gastro-intestinal (GIT) development of broilers. Poult. Sci. 92 (E-Suppl. 1):14. Presented at PSA Annual Meeting, San Diego, CA. Pacheco, W. J., A. C. Fahrenholz, C. R. Stark, P. R. Ferket, and J. Brake. 2014. Effect of particle size of distillers dried grains with solubles and soybean meal on pellet quality, nutrient digestibility, and broiler live performance. Poult. Sci. 93 (E-suppl. 1):24. Presented at PSA Annual Meeting, Corpus Christi, TX. Xu, Y., C. Stark, P. Ferket, and J. Brake. 2013. Effect of roller mill ground corn inclusion and floor types on gastric development, liver performance, and litter moisture in broilers. Poult. Sci. 92 (E-Suppl. 1):65. Presented at PSA Annual Meeting, San Diego, CA. Xu. Y., C. R. Stark, P. R. Ferket, C. M. Williams, W. J. Pacheco, and J. Brake. 2015. Effect of dietary coarsely ground corn on broiler live performance, gastrointestinal tract development, apparent ileal digestibility of energy and nitrogen, and digesta particle size distribution and retention time. Poult. Sci. 94:53-60.